Learn tips for decorating kids’ bedrooms – make it look beautiful and help your kids to feel at home in their own room. This post is sponsored by Shutterfly. One of the questions I get asked often is how I decorate my children’s rooms in a way that I like, but they also enjoy. I’ll be answering with all of my tips across a few posts, but today’s tip is all about making it personal. Such a perfect way to store items from the first few days of Heidi’s life – we love this shadowbox! Shop it here. My kids are all about their names. Seriously – they write their names on any paper, chalkboard, whiteboard…basically any surface they’re allowed to write on! When designing a space for your kids, whether it’s a bedroom or playroom, find a fun way to personalize it for them. When things are personalized, they feel ownership over it, and take pride in their space. My daughter’s nursery is finished and we LOVE it! See the whole room here. It’s important to go to the right place for your personalized decor. I got all of our kids personalized products from Shutterfly. They’re sponsoring this post, but I’ve been shopping through Shutterfly personally for over 10 years and I’ve always been a big fan of their products. What I love about them is that there’s a ton of options for home decor, and they’ll fit such a variety of styles. These beautiful canvas prints above the crib are amazing quality and help to easily fill up an empty wall with beautiful memories. Shop them here – this is the 20×30 size. Once you pick a place that you know you’ll love their options to choose from, you can get your kids involved! Have them help pick out their items for their own room, after you give them choices. My daughter fell in love with this kitten plate (with her name on it! ), and hey, who says that plates can’t be wall decor? 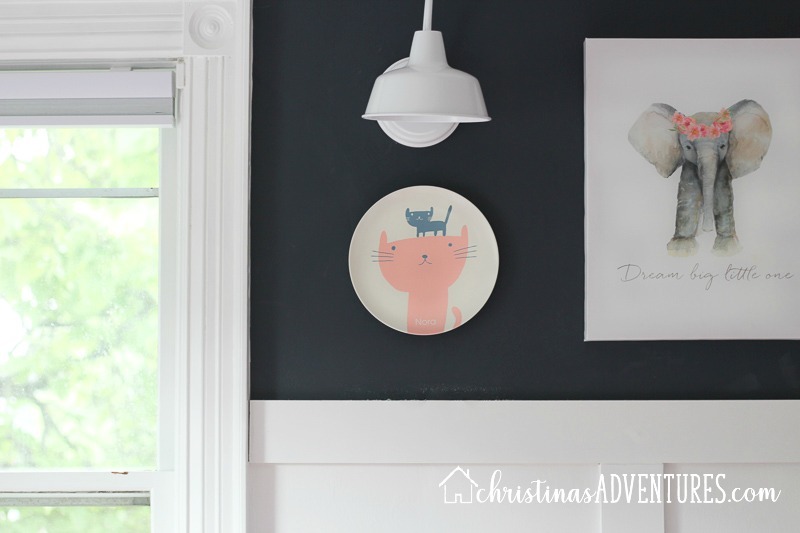 This plate can be used for food, but it’s SO cute as wall decor! Shop it here. I love that we picked out items for our daughter’s nursery that will be able to be used in her room as she gets older. This way, we don’t have to start from scratch when she gets a “big girl room” in a few more years. 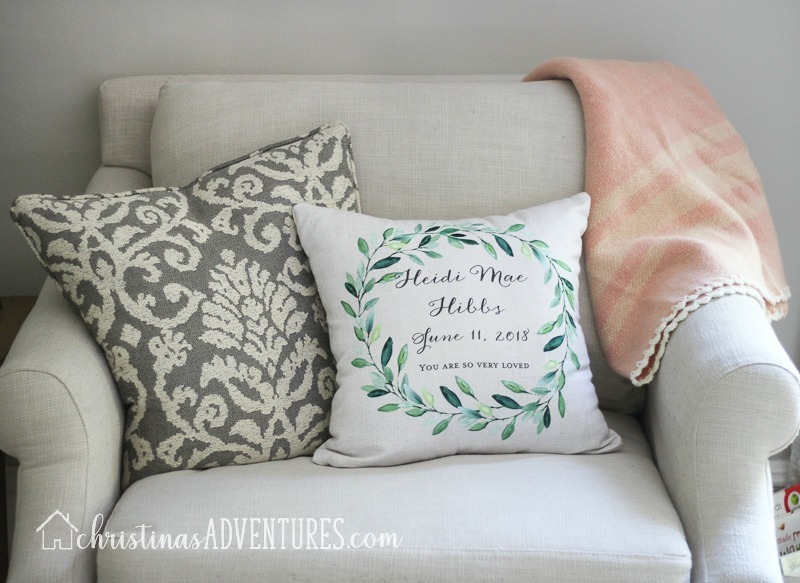 This personalized pillow is a beautiful accent piece that your child can keep for years to come! I love that it’s very customizable – you can add any text you’d like! Shop it here. In my daughter’s nursery, we chose pink to accent the navy walls we already had. When letting my daughter choose a personalized item from Shutterfly, I had already picked out things that would work in that color scheme. So when she chose this plate for her wall, I knew it would already work with the rest of the decor. The transition from two to three kids hasn’t been without it’s challenges, but making each kid feel special has helped tremendously. We made a big deal about my son’s pillow and said he was the ONLY one in the family who could use this pillow because no one else’s name starts with an I. He now says that every single night before bed and he chooses to sleep on his “I pillow”. Having an item with his initial on it made him feel special and valued, which helped him love the decor in his room. 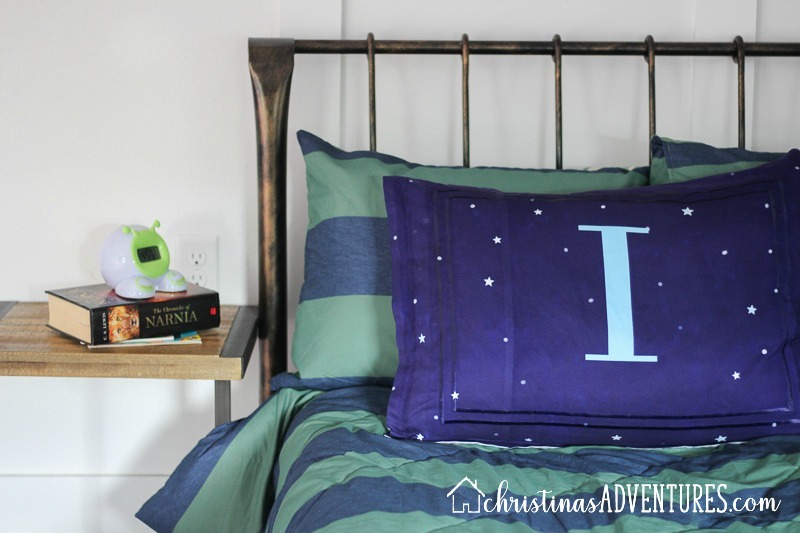 This pillow is the perfect addition to my son’s “big boy bed” – lots of personalization options too! Shop it here. When a child feels like they have a say in decorating their room, and that they have items that are personalized to them, they take ownership of their things in their own space. Then you can have a space that both you and your child love to spend time in! It can be tricky designing a space that you and your child both love to spend time in! Hopefully by getting your kids to help in the process, picking items that will grow with them, and making it special, you will achieve a beautifully decorated room that your kids will love being in! Hope you enjoyed these decorating tips brought to you in partnership with Shutterfly where you can shop for all your personalized home décor needs!